Phil Kingston, a former parole officer, is determined to fight for a future he’ll never see. He’s faced arrest upon arrest for his environmental activism. 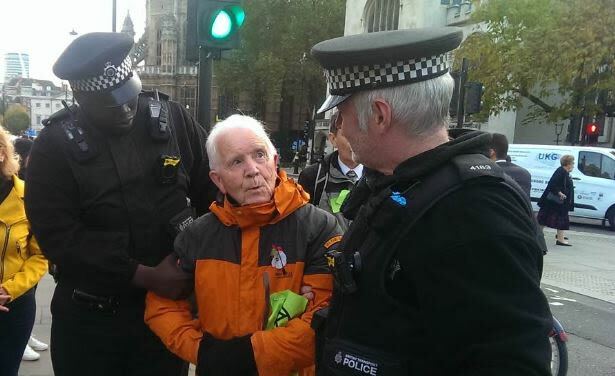 He is a member of Extinction Rebellion, a UK environmental group that coordinates campaigns of civil disobedience. I've heard it said many times that I'm too old to get involved in actions like this, but I can't just stay at home sipping tea when the future is crumbling away. Watch the stirring video below (or scroll down for quotes from it). When the law is supporting corporations in ruining the Earth; I’m not accepting that at all. I’ve had a long life; a very good life. I’m a very fortunate man. And if this is the way I go out; I couldn’t ask for anything more. When the last fish is caught; we’ll know that we can’t eat money. That is on the way. Love each other. And love the Earth. Let money be at the service of those two.